This post describes our second day visiting Floyd, Va, on Oct 5, 2007. Here’s the Day 1 post. On Friday we took our time getting up and out, enjoying the sounds of rural Virginia at the Miracle Farm B&B: cows mooing in the distance, crows and hawks playing their war games, and the mountain stream behind the farmhouse. We ate the delicious breakfast delivered by Ed and Karen and went out to explore Floyd. Since our cell phones were not getting a signal around Floyd, we went to a local retailer to buy a tracfone to check our voice mail and to make local calls. When we purchased it, I noticed a warning that only two phones per person can be purchased. I asked the store manager about regulation — she said that they enforced it strictly. Apparently they often get out-of-state cars with several passengers who buy as many phones as they can as often as they can. What is going on…? After we purchased a phone and checked our voice mail, we went to the public library to use the computers to check email. Then I dropped Ann at The Harvest Moon so she could determine if we can get the natural and organic foods that we like in Floyd. (Ann was impressed.) I went to Citizens, the telecommunications company just up the road, to discuss rural broadband access. I had an encouraging discussion with Shelia at Citizens that gave me confidence that fast Internet and cable TV are available in much of Floyd County. A few blocks west of the public library, Epperly Mill Rd turns south off of West Main St. Seeing that street sign triggered a memory — I visited Floyd many years ago with childhood friend John David Epperly and his father. I remember that Mr. Epperly grew up in Floyd — I’ve recently learned that Epperly Mill Rd. was named after Mr. Epperly’s grandfather, who owned the Mill. 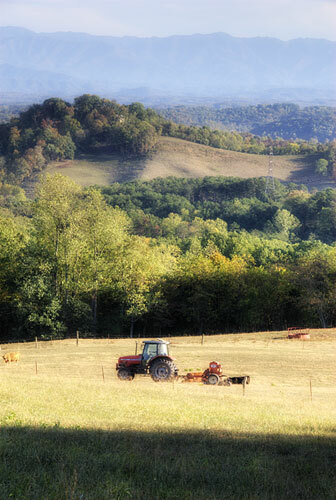 In the afternoon we drove east on Franklin Pike to look at the countryside. Floyd’s terrain is dominated by rolling hills with mountains in the distance. The entire county is situated on a high plateau of the Blue Ridge Mountains, at an average elevation of about 2,500 feet. The landscape is almost an even mix of pasture land and forest, with many beautiful evergreens that look like Christmas trees. Occasionally we saw antique car museums (junk yards), which do not improve the aesthetics or the value of the property. We stopped at the Floyd Dry Goods Store. Amy Gravely, who had lived in my home town of Martinsville for several years, runs the store, which has quite a unique mix of interesting goods. We enjoyed the store and the conversation. We returned to the Floyd Country Store for a late lunch. I saw Doug Thompson, local blogger and photo-journalist (his photo above), sitting on a bench in front of the store. I introduced myself to Doug and starting asking questions. Doug grew up in Floyd and returned to Floyd from Washington, DC, after spending many years traveling the world photographing wars and other current events. He writes the Blue Ridge Muse blog and knows almost everyone in Floyd County. Doug is quite a story teller — he entertained Ann and me for quite a while. We went to Over the Moon Gallery & Cafe restaurant for dinner. It’s located above the Harvest Moon store. We enjoyed the acoustic music performed by a local musician. Almost every eating establishment in the town of Floyd features good music, often from live performers. The next stop was the Friday night jamboree at the Floyd Country Store. This is the event of the week that brings everyone together for socializing and music. Unlike most music venues, no alcohol is served — we saw Woody Crenshaw, owner, scooping ice cream for kids. Families bring children to this event — we saw young children having a great time dancing. We watched Doug Thompson taking photos — I enjoyed watching a pro spot an interesting scene and capture it immediately. The blue grass jamboree cost $3 at the door. It draws a crowd — there were about 500 people in and near the Country Store. After the second band left the stage, a ticket was drawn from the fish bowl for the raffle and I won! Is that a sign? On the way back to the car, we saw Doug Thompson in the Cafe del Sol having a coffee and sat down with him. He introduced us to Sally, the owner, who is also a vocalist in a local band. Cafe del Sol and The Floyd Country Store both provide wi-fi for customers.